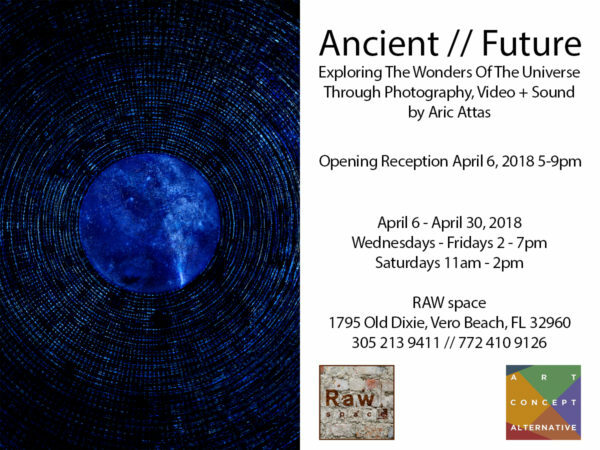 I’m very excited to announce the opening of my retrospective exhibition at RAW Space in Vero Beach, FL! Ancient // Future will feature over 20 years of photography, video and soundscapes exploring the wonders of the universe. Please visit my Fine Art page to preview some of the work that will be featured in the show. The exhibition will run from April 6 – 30, 2018 with a free opening reception at the gallery April 6th from 5-9pm. Special thanks to Neli Santamarina, Silvia Medina and Niurka Barroso for helping make this happen!